CWM joined hands with Ganesh Poudel and the Dhankuta District Ecumenical Fellowship in 2014. Since then, we have supported two female Bible teacher/evangelists, sponsored an annual women’s conference, and an annual training event for church leaders. Hidden far in the east of Nepal, in the foothills of the Himalayas, Ganesh’s village, Pakhribas sits at 4500 ft, and on a clear day, you can see towering Mt. Everest, 100 miles away. Pakhribas is the primary site of the Nepali Agricultural Experiment station, and Ganesh’s wife, Lydia, worked there for many years. Ganesh & Lydia were both Hindu when one of her co-workers began sharing the Gospel with her. Ganesh was an alcoholic, and though he was a hard worker, their marriage and family were suffering. When Lydia decided to follow Christ, he saw the tremendous peace and joy she had, and he soon followed her lead. Not long after, he began preaching the Gospel all around their district, and became one of the most effective evangelists in eastern Nepal. Raising up a group of young people, they entered villages to perform cultural dances and teach good hygiene and health practices. 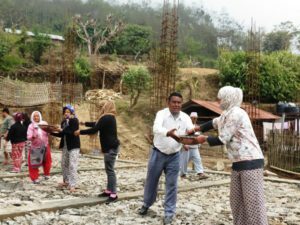 They have established churches in many villages and continue their evangelism efforts, adding to that caring for the sick, holding Bible studies for believers and seekers, and providing food and medicine for struggling families. 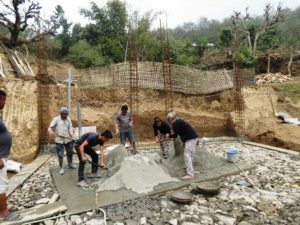 Click here to read more about the work that CWM is doing in Nepal. NOTE: In April 2015, a massive 7.9 magnitude earthquake stru ck central Nepal, about 30 miles west of Kathmandu, the capital city. Aftershocks continued to rumble for 10 more days, causing property damage as far away as eastern Nepal, including the Dhankuta District. On May 12, another quake, magnitude 7.3, struck just 64 miles from Pakhribas, causing already weakened structures to collapse, mudslides to cover road access to remote villages, and families to fearfully sleep outside in tents, in pouring rain. 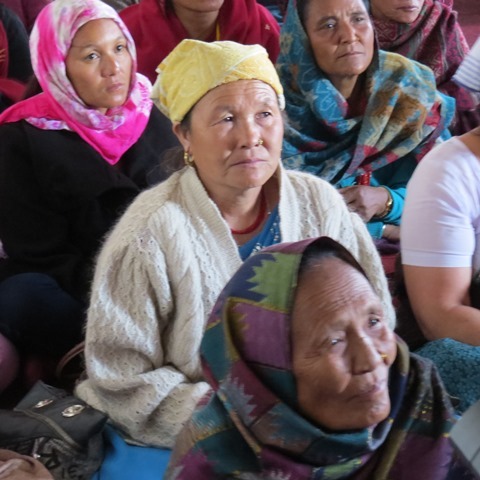 Christian World Missions is working with a missionary friend who serves in Darjeeling, India. He has agreed to travel to Pakhribas, survey and assess the damage in the Dhankuta District, and make recommendations to us for recovery. We are currently receiving donations for earthquake relief, and will continue to help with the rebuilding for as long as there is need. If you would like to make a donation, please feel free to visit our donation page. 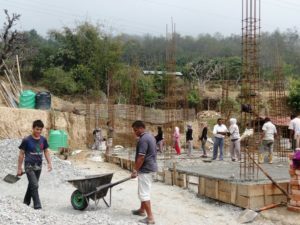 Ganesh helping the team rebuild after the earthquakes. The team is working hard to repair the damages done by the earthquake. Click here to see and hear more of the sights and sounds of Nepal.